There are about 16 species of barn owl, and they live on every continent in the world except Antarctica. We have one species in North America, Tyto alba. This stone sculpture was inspired by the untypical story of a young biologist who raised a 4-day-old barn owl and cared for it for 19 years. The book is Wesley the Owl, written by Stacey O’Brien—a great read if you enjoy animal stories. A close friendship with an animal is a profound experience and enriches one’s life. “The Untypical Owl” is a celebration of the deep bond that can happen between people and animals, wild or domestic. The Untypical Owl is composed of simple, mostly geometric shapes (like animated characters.) Barn owls are covered in a huge layer of dry, fluffy, light feathers. Under these feathers their forms are very complex. The skull of the barn owl is fairly small and most of the skull is eye sockets and beak. The eyes are huge—so big there is no room for eyeball muscles. (This is why owls move their heads so much—they can’t move their eyeballs.) The beak is huge—so big the owl can swallow a mouse whole. All we see of the beak is the tiny tip, the rest is hidden in feathers. Barn owl wing feathers are huge and cover up the tail when the wings are folded. Barn owl legs are very, very long because they need to reach down into tall grass to catch mice. 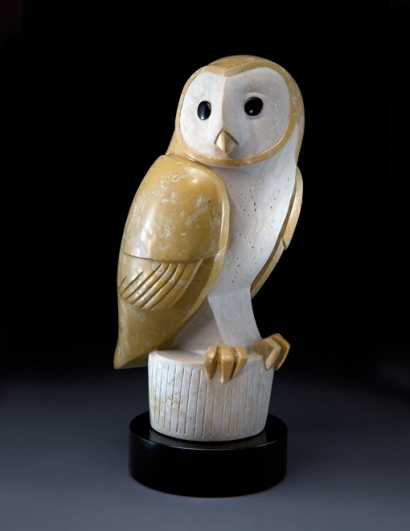 In the pose of this sculpture it looks like the owl has short legs. In reality, we see the talons, and the long legs are engulfed in feathers. Think of the pose of the owl as if a person were crouching down on his toes. The foot bones extend behind (this is the slanted leg shape seen in the sculpture.) The lower leg bones extend forward to the knees which are about where we think we are seeing the chest of the owl. The thighs extend back, and the pelvis, rib cage and neck are all in the upper third of the body silhouette. One must work very hard for this beauty. The thin veins of dark color are particularly soft and have a tendency to want to come apart. The basic yellow part of the stone is so hard it stripped the diamonds from my cutting blade. Carving was an adventure as the stone is quite brittle and cannot withstand a great deal of vibration–lots of flying shards. Finishing was another adventure. The white and lighter yellow areas are extremely hard and required a lot of pressure in sanding while the darker areas needed almost no pressure. Happily, by the time I was finished with the sanding I had figured out many ways to recognize and accommodate the different hardnesses in the stone. Discovering its secrets makes me love the stone (and the sculpture) even more. The dark yellow is polished stone, the light areas are raw stone.